The Book Meme | The Book Meme – The Republic of T.
I’m not sure where “The Book Meme” started, but after seeing it at A Stitch in Haste I thought it might be a good idea. Unlike Kip, I’m a big fan of blog memes, if only because I usually pick up something interesting from other people’s responses. And since I’m an even bigger fan of books, who’s always on the lookout for reading suggestions to add to my ever-growing “to read” list, this one was a natural fit. If you want to jump in, feel free to post your own picks in the comments, or link back here if you post it on your own blog (I’d just like to see other people’s answers). One book that changed my life. 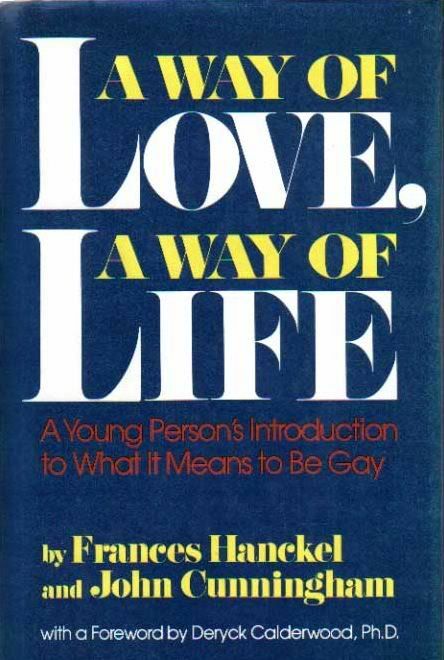 Without a doubt this would have to be A way of love, a way of life: A young person’s introduction to what it means to be gay by Francis Hanckel and John Cunningham. I came across it back when I was a 12-year-old skinny, gay, black boy growing up in Georgia, during the Reagan era. Needless to say, I needed a refuge and I found it in books. So, I spend a lot of time in libraries, which is where I came across this book. As for how it changed my life, I wrote about that earlier. I went back to school with a little more confidence, because I knew being gay didn’t mean I was a freak or some kind of defective. I knew there were others like me, and I knew that there were place and people out there that would be accepting, and that I just had to find them. And suddenly I was out. There were whispers of “Oh, my god,” and “He admitted it!” I’m sure it was all over school soon after that. Yup. That’s the book that led to my coming out. So you have it to thank or blame in that regard. If that book saved my life, then Brother to Brother: New Writings by Black Gay Men saved my sanity when I picked it up while I was in college. In the Life: A Black Gay Anthology came next. Between the two, it was the first time I’d read anything written by people whose experiences were so close to mine. Again, the effect was just knowing that I wasn’t “the only one,” which went a long way to keeping me relatively sane and helping me find my voice and use it to address my own experience. There are some other titles that have been life changing, just in the way that they affected by outlook on the world. Howard Zinn’s People’s History of the United States: 1492 to Present is one that will always have a place on my bookshelf, because it confirmed what I always thought when I sat through all those history classes in school: I wasn’t getting the whole story. I plan to have it around when my kids are in school, so they can use it as a reference when they have to sit in history class. Along those same lines, The Culture of Make Believe and Rivers of Blood, Rivers of Gold: Europe’s Conquest of Indigenous Peoples will be available for the same purposes. One book I’ve read more than once. This is a hard one because I haven’t been in the habit of re-reading stuff that I’ve already plowed through at least once, because there’s so much out there that I want to read but have yet to crack open. So many books, so little time. But there are at least two that come to mind as repeat reads. I read Toni Morrison’s Beloved when it was first published. I checked it out of the library and read it when I was probably still in 8th or 9th grade. Not only was I an avid reader, but an ambitious one. Truth be known, Morrison’s work was probably a bit over my head. (I attempted, around that time, to read Ulysses and quickly decided I was in over my head.) I discovered one does not just read Morrison. You have to bring something to a Toni Morrison book. It wasn’t until years later, after moving to D.C., that I read it again and discovered things that I didn’t or couldn’t see the first time I read it. One book that I find myself thinking about and wanting to re-read at some point is Kim Stanley Robinson’s The Years of Rice and Salt, an alternate history of epic proportions, that imagines what the world would have been like if the Black Death had wiped out 99% of Europe’s population. (Surprise, surprise, it’s not exactly a utopia. There’s still war, slavery, colonialism, etc.) I particularly like how he worked with the same characters over hundreds of years, by employing reincarnation as a literary device. One book I would want on a desert island. Another hard one. I’m not sure I could narrow it down to just one. But I’m open to suggestions. One that comes to mind is actually Street Zen: The Life and Work of Issan Dorsey. Just the telling of his journey from cross-dressing prostitute to drug addict to Zen Buddhist monk is fascinating, but it’s remained on my shelf because the initial reading left me feeling that there was much there I would appreciate more when I returned to the book. Beyond that, I might take along any number of books that have impressed me over the years. But probably Lovingkindness: The Revolutionary Art of Happiness and Peace Is Every Step: The Path of Mindfulness in Everyday Life would make the short list. One book that made me laugh. One book that made me cry. This is a hard one because books and movies generally don’t make me cry. I think it’s because I learned to disassociate myself from my emotions at an early age (growing up a skinny, black, effeminate, non-athletic, bookish, bespectacled gay boy in the South during the Reagan area will teach you that), as a way of protecting myself. It’s only in the past few years that I’ve gotten back in touch with them. I think being a parent and having a husband are at least partially responsible for the change. If I think about long enough, probably the book that comes closest to this category is Death Be Not Proud. It had that effect on me when I read it as a high school student, and I’m sure it would have a even more profound effect today if I read it as a parent. Prayers for Bobby: A Mother’s Coming to Terms with the Suicide of Her Gay Son is another one that moved me in that manner. One book I wish I had written. Are you kidding me? Just one? As a writer, it’s almost impossible for me to pick just one, because there are any number of books I’ve read that left me either inspired or envious, and wishing I’d penned them myself. Pick any number of James Baldwin’s books, but Giovanni’s Room and Just Above My Head definitely make the list. Throw in Octavis Butler’s Kindred, Jonathan Franzen’s The Corrections and Morrison’s Beloved (see above), for starteers. One book I wish had never been written. Honestly? I can’t think of one single title. Bell Curve: Intelligence and Class Structure in American Life comes to mind. Mein Kampf is another obvious choice. Add the entire Left Behind Series, and just about anything written by James Dobson, and I’d say we’re off to a good start. One book I’m currently reading. Well, I just finished a series of three book on religious fundamentalism in American today (and plan to review them all in an upcoming post). At the end of that I decided to tack on When Religion Becomes Evil: Five Warning Signs, which I finished last night. Afterwards I picked up The Sins of Scripture: Exposing the Bible’s Texts of Hate to Reveal the God of Love because I wanted to get a different take on that book that inspires so many on the extreme right, and that I spent so much time learning about while I was growing up (before I became alienated to the point of throwing out the last copy I had years ago, and thus don’t have a copy of today). One book I’ve been meaning to read. Again, the list is long. The next book on the list, coming to me via BookMooch, is Them: Adventures with Extremists, because it seems at least somewhat related to the books I just finished reading. After that I’ll probably take up Freethinkers: A History of American Secularism to round out the current topic before moving on to something else. Along those lines MAD COWBOY: Plain Truth from the Cattle Rancher Who Won’t Eat Meat and Food Fight are near the front of the “to read” queue. Someone to tag for this meme. Um. Anybody who wants to join in. How’s that? First time over Easter vacation when I was eight; at least a dozen times since. After all, I do want to survive. I started the book on a plane, and found myself laughing out loud so much I finally had to put the book away. I know; I was a kid. So sue me. I still get a lump just thinking about it. This book could also have been listed under #1. I chose the college that I wanted to go to, based on the fact that Eiseley taught there. One of my great regrets is that I decided to take his class on the history of science in my sophomore year, so I could complete my early requirements; he died the summer between my freshman and sophomore year. Not well enough read to pick the precise book, but it was written by St. Augustine of Hippo. Whichever book summarizes his philosophy of intolerance and anti-intellectualism, and sexual shame. A warts-and-all series of stories centered on faith and parenthood. It’s been sitting on my shelves for years. I’ll get to it eventually.